ad kommunikation is a service provider for everything to do with exhibiting. Their services range from consulting, planning and implementation to the communication of the exhibition in the media. 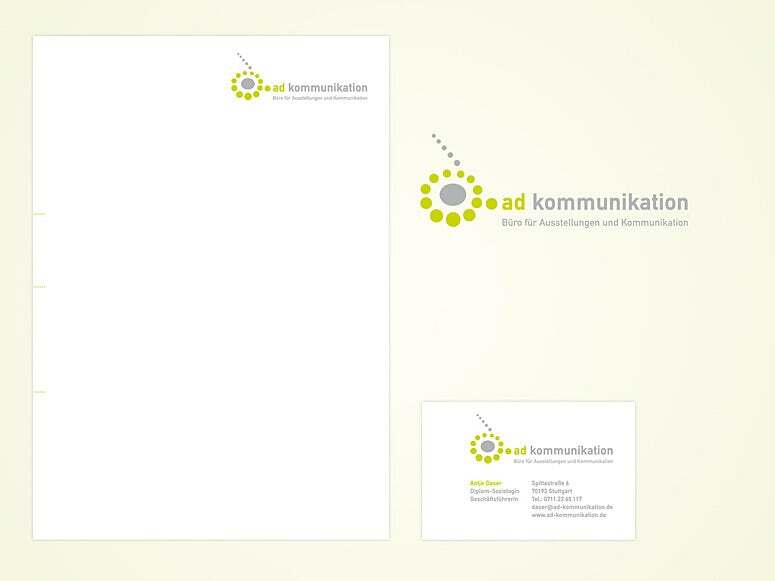 ad kommunikation's logo symbolises the "object being exhibited" which arouses the interest of the viewer/visitor. In addition, the removed dots depict a small "a" and "d" for "ad". The flyer was created about one year before the newly designed logo and business stationery. It was important for the company manager that the address details etc. in the letterhead could be changed at a later date. Therefore, only the logo was printed on the letterhead in the Pantone special colours green and silver in offset printing. The rest is printed using a laser printer. The business cards, flyer and letterhead give a uniform, harmonious image.